After 18 months of probing, the Ministry of Commerce and Industry has recommended anti-dumping duty on solar cells imported from the US, China, Taiwan and Malaysia. Anti-dumping duty is imposed on foreign imports that are priced lower than their actual cost. The practice called dumping forces domestic manufacturers to shut shop because imported products are cheaper. In January 2012, solar cell manufacturers Indosolar Limited, Jupiter Solar Power Limited and Websol Energy Systems Ltd had complained to the commerce ministry that the four countries were dumping solar cells in the Indian market. Solar cells are put together to make solar panels. Solar power project developers started buying the cheaper goods which led to closure of 75 per cent of the 1,200 MW domestic cell industry. Following this, the Directorate General of Anti-Dumping and Allied Duties in the commerce ministry began its probe in November 2012 and on May 22, this year, it suggested imposing a duty of US $0.11 to US $0.81 per Watt on cells to correct the distortion in the domestic market. But the duty will be imposed only after the finance ministry notifies it. “If the duty is imposed, we will finally get a level-playing field. Indian manufacturers have suffered tremendous injury due to the unfair trade practice,” says H R Gupta, managing director of Indosolar Limited. The Noida-based company, that manufactured 450 MW capacity cells, has closed down. The domestic solar cell manufacturing industry may be upbeat about the recommendation, but the Ministry of New and Renewable Energy (MNRE), project developers and some renewable energy experts warn it can stymie the solar power sector in India. In a letter to the finance ministry, MNRE, has stated, “Duty on cells will increase the price of panels, which will raise the project cost and, in turn, solar tariff.” Panels constitute 60 per cent of a solar power project cost. “This is not the right time to impose duty. The government has already tendered 3,500 MW capacity projects. Most of these will use imported cells, so developers may lose interest in executing the projects,” says Tarun Kapoor, joint secretary, MNRE. The average import price of a solar cell is US $0.60 per Watt. If US $0.81 duty is imposed on it, the price will rise to US $1.41 per Watt. As per MNRE, a project’s cost will rise by 10-15 per cent. But developers say tariff increase would be more. “Solar power tariff, which is Rs 7-8 per unit now, will jump to Rs 10-11 per unit,” says Kishor Nair, CEO of Welspun Energy Ltd. Governments of Karnataka, Himachal Pradesh, Madhya Pradesh have already written to the Centre opposing the duty. The country has 2,821 MW solar power installed. “Our objective should be to reduce the cost of solar power, not increase it,” say solar power developers. Due to competition in the domestic market, the cost of solar energy crashed from Rs 18 per unit five years ago to Rs 7-8 per unit now, they say. “Duty would be detrimental to the solar sector at a time when we are so close to grid parity,” says Gaurav Sood, managing director, Solair-direct, Pune-based developer. 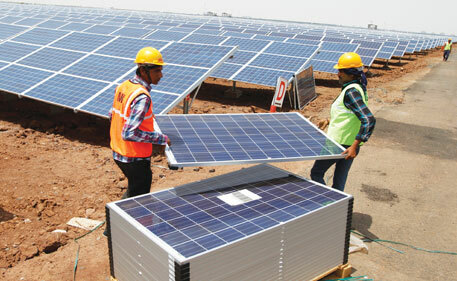 “The already cash-strapped power distribution companies are reluctant to buy solar power. They say it is expensive. 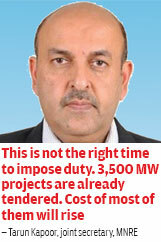 They would become even more hesitant,” says Indrapreet Wadhwa, CEO of Azure Power, project developer in Delhi. “The biggest loser will be the consumer,” says Nair. “A success story was shaping up in rural India where people were shifting from the kerosene- or diesel-based power to the cheaper solar power. The story may reverse,” he says. Diesel power costs Rs 18 per unit. Gupta of Indosolar is not ready to buy these arguments. India is not the only country to impose duty, he says. 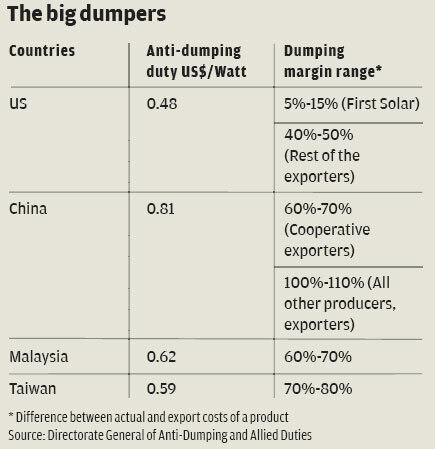 In 2012, the US imposed 31 per cent to 250 per cent anti-dumping duty on Chinese panels. In 2013, EU charged an average 47.7 per cent duty on Chinese imports. The domestic industry has long been complaining that solar manufacturers in China and Taiwan enjoy massive state subsidies. This created a glut of cells in their own market. When the US and EU closed doors to their products, China and Taiwan started dumping them in India. The US pushed its panels in India through fast start financing (see ‘US, the winner in India’s solar mission’). “The duty may increase solar tariff for some time but in the long run everybody will benefit. It is for the government to decide whether we want to be a nation of traders or of self-sufficient domestic industry,” says Dhruv Sharma, CEO of Jupiter Solar, Kolkata-based manufacturer of solar cells. There are other ways to promote the domestic industry, says Kapoor. “We need a robust domestic solar industry. It is for this reason we reserved 375 MW of the total 750 MW for domestic players under batch 1 of phase 2 of the Jawaharlal Nehru National Solar Mission,” he says. Chandra Bhushan, deputy director-general of the Centre for Science and Environment, a Delhi-based non-profit, concurs. “The government can give soft loans to developers who buy from domestic industry besides other incentives to promote domestic manufacturing,” he says. The domestic cell industry says it can take care of 375 MW of the national solar mission. It plans to increase the capacity to 1,000 MW within a year if fair trade is established. Bhushan expresses concern that the duty will benefit only a handful of Indian cell manufacturers. “They may cartelise in future and jack up the prices when the cost of imported solar cells increases,” he says. “We should have our objective clear, which is to bring down the cost of clean energy while protecting the domestic industry. We have to strike a balance,” he adds. ON MAY 23, the World Trade Organization formed a panel to probe a complaint filed by the US. It says the Jawaharlal Nehru National Solar Mission interferes with free trade as it favours domestic sourcing of solar panels. India has denied the charge. The Centre for Science and Environment (CSE), a Delhi-based non-profit, says the US is trying to browbeat India to further the interest of its own solar companies. The US has used to its advantage the climate "fast start financing", a US $30 billion fund set up under the United Nations Framework Convention on Climate Change. The fund, adopted at the Copenhagen climate meet in 2009, was supposed to help developing countries deal with climate change impacts and limit greenhouse gas emissions. The US Exim Bank and the Overseas Private Investment Corporation offer lowinterest loans to Indian project developers on the condition that they buy equipment, panels and cells from US firms. This has distorted the market in favour of the US. A CSE estimate shows in the first phase of the solar mission about half of the panels were made in the US, which is promoting its domestic industry but is not allowing India to do the same. Anti-dumping duty on solar cells imported from the US, China, Taiwan and Malaysia is OK.But here the crux of the problem is will Indian Solar Industry geared to meet the growing demand of Solar PV? Has the Quality of Indian Solar Products match the best from abroad? When the quality of Indian Products is ensured,nobody prefers to go for foreign goods even if the domestic ones cost a bit higher. Are not Indian Watches proved their world quality? In the past it was fashionable to wear watches imported.